Doug Aitken’s mirrored mirage house installed in Swiss alps. The exhibitions to look forward to in 2019. What the art world is looking forward to in 2019 across Asia, the Middle East and Australasia. 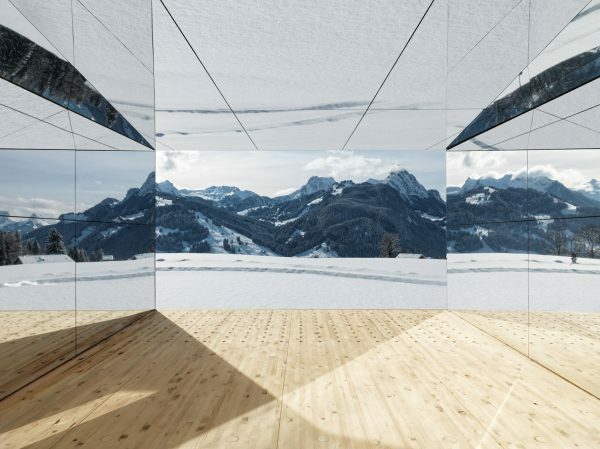 As Swiss art fair Artgenève opens its doors, your guide to the best shows in town. First Bangkok Art Biennale shows off city with art from near and far. The most Instagrammed artworks from Art Basel in Miami Beach 2018. Felipe Pantone becomes first contemporary artist to create Instagram face filters. Ramiken Gallery wins Armory Show’s inaugural Gramercy International Prize. Picasso’s drawings of bulls inspired Apple’s famously simple designs. Kehinde Wiley’s painted elegies for Wiley Ferguson. How Tomokazu Matsuyama appropriates images to create fine art. Swizz Beatz teams up with UTA Artist Space to showcase black artists in Los Angeles. Cecily Brown donates behemoth painting to Louisiana Museum in Denmark. Guggenheim deaccessions work by Zao Wou-Ki as the market for the artist swells. Phillips grew an impressive 29% in 2018 by focusing on winning categories. Elisabeth-Louise Vigée Le Brun painting sells at Sotheby’s Old Masters sale for $7.18 million, breaking record. Peter Paul Rubens drawing sells for record-setting $8.2 million at Sotheby’s. The British Museum has acquired its first work by Banksy. Grappling with the legacy of the woman who shot Andy Warhol. How nuns have shaped the course of art history. Inside New York’s last remaining artists’ housing. New York’s scrapped L-train shutdown is an emotional rollercoaster for Brooklyn-based galleries. 9 famous sites from art history are in danger of destruction. A tribute to Manny Faber’s “Termite Art” at MOCA Los Angeles creates a trans-historical dialogue. Hirshhorn extends Charline von Heyl show shuttered by shutdown. Museum of Contemporary Art Chicago offers discount tickets to gender pay gap victims. Art shippers play catch-up following U.S. Government shutdown. PODCAST: Expectations and epiphanies with NPG Director Nicholas Cullinan. “Velvet Buzzsaw,” Netflix’s new art-world horror flick, is a bloody mess. A new Studio Swine exhibition in Brooklyn shines a light on, light. Olafur Eliasson to bring fog tunnel and rainbow mist to Tate Modern. Charlotte Keates’ paintings invite us into an all-American “dreamscape”. Meet the Berlin-based artist Claudia Wieser melding Bauhaus and ancient Rome. Sasha Gordon’s intimate paintings explore her biracial identity. The magical life of 98-year-old painter Luchita Hurtado. Luchita Hurtado’s first solo exhibition, “Dark Years”, focuses on the artist’s early works from the 1940s – 1950s. Artist Susan Hiller, explorer of consciousness and the occult, dies aged 78. How paraconceptualist artist Susan Hiller (1940-2019) probed the fringes of the familiar. Carolee Schneemann, Jeff Preiss and Geeta Dayal pay tribute to Jonas Mekas (1922–2019). These photographs capture the defiant sexuality of Punk. Photographer Heji Shin on shooting Kanye West, x-rays, and power. Mezzanine DNA matt black spray paint by Massive Attack wins Wallpaper Design Award. Artist makes blackest black paint in the world to protest Anish Kapoor. The artist-turned-color expert who made the perfect white paint. An artist and a curator’s death-defying dives 200 feet below the Pacific. Video art tales from China’s subtropical urban sprawl. 10 creative online courses you can take for free online. A new app is using art to help you feel better.